Both Sinn and we have received many requests for a standard release of the "Large U", and we're pleased to announce the new Sinn U212 EZM 16 on silicone rubber strap is now part of the permanent collection. The U212 and U212A are the cream of the German submarine crop - they represent Germany's excellence in both technology and construction. The submarine was designed for the navy in both Germany and Italy, and is non-nuclear. The propulsion system is quite unique - it uses hydrogen/oxygen propulsion. This method had been considered before, but was deemed a health and fire risk. The German U212 and U212A have developed a system to relocate the tanks and change the way the mixture is used, making this propulsion system safe. This submarine can stay submerged for up to three weeks. 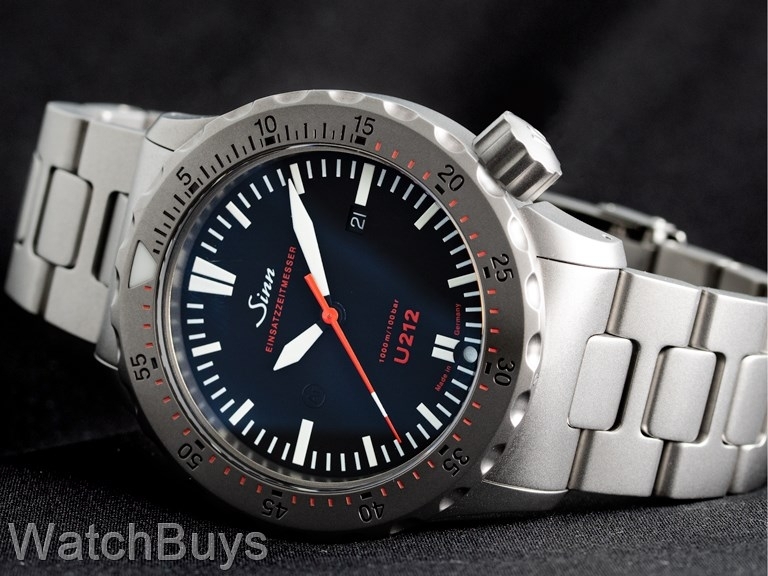 This cutting edge technology and excellence in engineering is what Sinn brings to the new Sinn U212 EZM 16. Verified Owner Comments: Absolutely the best Sinn yet. Love this watch. The only negative is the lume which is rather weak unfortunately. Would love to see this watch done with the fantastic blue dial that we've seen in the past on the U1000. And please Sinn, get your act together with the lume!